There are many different marine battery chargers to consider. The usual big marine brands are present too: NOCO, Minn Kota, ProMariner and Schumacher too. Generally, you get what you pay for with brands. A poor-quality charger is going to overcharge your battery causing it to need to be replaced sooner and each subsequent battery more often too. That gets expensive over time vs just buying a better-quality battery charger, to begin with. The main thing to consider other than the brand is the number of banks with a charger. This way, you can charge two different batteries together and they’ll both eventually be charged to their maximum individual capacity. The amps the charger can deliver is important too as it helps indicate how long each battery will take to recharge. With amps vs amp hours of the battery, taking a 10-amp charger and using on a 100-amp battery, dividing one into the other gives a 10-hour battery charging time. Add an extra 10 percent (or one hour more in this example) to top up to 100% which takes longer to achieve, makes the probably charging time around 11 hours. Clearly, a charger that delivers more amps or more amps per bank with a battery hooked up is going to charge the same amp hour capacity battery faster. A low amp charger is cheaper for sure, but you’ll be waiting longer for each battery to finish charging up. However, always install a charger that abides by the American Boat and Yacht Council (ABYC) guidelines. The NOCO Genius GENM2 8 Amp 2-Bank Waterproof is the previous generation of NOCO Genius chargers (there are GEN3 models out too now). The models range from a 1 bank, 4-amp model right up to a 4 bank, 40-amp model. The charger is focused on recharging 12-volt rechargeable batteries. It works with a wide range of types including AGM, gel, wet and MF models with a 20 to 120 Ah capacity. There are some excellent safety features including such as being spark free when hooking batteries up. It’s an open circuit, short circuit, and reverse hook up the model that avoids overheating. Both the range of hookup options and battery model types are pleasing. There’s a useful recovery mode to bring new life into tired batteries that still have a few charges left in them yet. The pulse charging feature also helps sulfated batteries recover as well as batteries that have almost no juice left in them and struggle to recharge from that status. l allows the charger to hook up to golf batteries, AGM deep cycle and a host of other types. 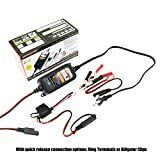 Indeed, this charger can be used to charge batteries for ATV’s. watercraft, snowmobiles, motorcycles, lawn mowers, RV batteries, golf batteries and much more. There are several models available from the 0.75-amp version right up to this 4-bank, 4.4-amp model, or a 26-amp model for charging a single battery quickly. There’s an overcharge protection, the reverse polarity is supported too, and no sparks will come out when connected. The charge supports batteries with up to 25-30-amp hours. The support for both deep cycle and AGM batteries is extremely useful for RV’ers and motorsport enthusiasts alike. Supports batteries for RV’s, ATV’s, golf carts, etc. The ProMariner 43021 ProSport 20+ Generation 3 20 Amp, 12/24/36 Volt, 3 Bank Battery Charger is a beast. With 20 amps at its disposal, it’s capable of recharging a battery is a reasonable period. Along with fast charging features, this ProSport also can keep batteries topped up over time without overcharging them. There are three banks for three batteries that can be separately charged, concurrently. The indicators confirm how each battery is doing. The charger is capable of reconditioning batteries that are older or charging a completely dead battery with a 0% load. 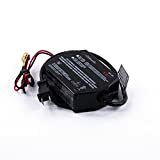 Whether needing a battery charged for the house with a solar-based system or for a trolling motor, this one is durable with its use of aluminum in the casing. The DC safety fuses are fitted inline. There’s reverse polarity, over temperature, over-voltage, overload and protection from ignition too; plenty of safety features to please people concerned for their boat. Batteries are reconditioned automatically every month when plugged in. There are many different ProSport models to choose from other than the ProMariner 43021. The MinnKota MK 210D On-Board Battery Charger (2 Banks, 5 amps per bank) is a sophisticated product intended for use on a boat. It provides for quick charging while avoiding overcharging. The charging process works by using stages which helps to get a better charge on the battery that’s a little older. The temperature is also monitored to avoid overheating during the charging. There are smart status updates to make it clear the status of a batteries being recharged. A maintenance mode is also useful to keep a battery topped up that’s plugged in for an extended period. The battery has a 10-amp capability that is split into 5 amps per bank. The charger has been tested for corrosion and is rated to work with salt water too. A microprocessor is employed to provide accurate battery charging and turn off charging when the battery is full. This avoids battery damage due to overcharging and lowers the cost of ownership. 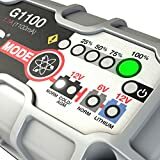 The NOCO Genius G1100 6V/12V 1.1A UltraSafe Smart Battery Charger is a smaller unit that can charge a 6-volt or 12-volt battery without difficulty. As with other NOCO Genius models, there are models in the range from 0.75 amps up to 26 amps depending on your needs (at least one of which is separately reviewed in this guide). Lead-acid battery types are supported up 25 amps or so without difficulty. The model has excellent LED lights to make it clear on the battery’s charging status. Support is provided for the garden, RV, golf cart, motorcycle, ATV, snowmobile, and other types of products that are battery powered. AGM and deep cycle batteries are fully supported too. Certain types of batteries support a 6-volt or 12-volt charge. The usual spark protection, avoidance of overcharging, and acceptance of reverse polarity are here with this Genius G1100 version. The Schumacher SE-1-12S-CA Fully Automatic Onboard Battery Charger is a low powered system for boats that need nothing more. It runs on auto and will turn itself off to save power as needed too. The charger can maintain the charge level on a battery over time or charge batteries plugged in for a limited time just to charge them up. Can plug directly into a power outlet socket. Has reverse polarity protection to protect batteries from damage. It comes in a plastic case that’s sealed against damp or water intrusion. The Schumacher SC-1200A-CA SpeedCharge 12Amp 6/12V Fully Automatic Battery Charger is a fast charging system. The product supports both 6 amps and 12 amp charging processes. There is a microprocessor present to manage how much batteries are recharged to avoid overcharging. A 3-amp maintaining facility is included to keep batteries topped up when connected for a long period. The total of 12-amps is available in a variety of possible configurations. The battery voltage is detected as either 6-volt or 12-volt and the charging mode adjusted automatically. An LED light shines when a battery has been connected using reverse polarity. The number of amps fed into a battery is adjusted according to requirements which keep batteries healthy for longer and not needing replacement as often. A float mode can monitor should that be needed too. Supplied with two color-coded positive and negative clamps. There’s a sturdy carry handle at the top. The charged percentage is shown on the LED display on the left. Various other indicators including a rate of charging and battery type are shown on the front too. The STANLEY BC15BS 15 Amp Bench Battery Charger with 40 Amp Engine Start and Alternator Check is a rugged unit with two bars affixed to the front of it. can also be used to get your engine going when your car battery is dead because you left the headlamps on overnight. The model can charge WET, GEL, or AGM batteries, as well as 12-volt ones commonly used on boats. There’s a higher frequency setup that offers three possible stages. These are a rapid charging mode, a slower top-off section to get a battery fully charged up, and a trickle charge option to leave it hooked up to avoid losing too much charge from lack of use. There’s a useful reconditioning feature to help older, worn batteries get a few more charges before they give up the ghost. The aforementioned engine start does take 1 minute and 30 seconds to function, so it’s not instant but it will get your vehicle ready to drive to your job. The useful LCD screen is an improvement over the LED displays that most other models offer if they have a display at all. The current amp, current battery level, and the battery hookup status are all shown. There’s a protection and indication system when hooking up a battery with reverse polarity. A panel of four buttons to the right of the LCD screen offers other quick options like Engine start, Alternative check, Battery voltage and Battery Recond(ition). The alternator check is intended to verify whether it is doing a satisfactory job keeping the car battery level steady or not. The alternator check, which is a patented method, is certified by ETL. Supports WET, GEL, or AGM batteries, plus 12-volt batteries used in boats. The main thing with buying a marine battery charger is understanding your needs. Is a lower amperage going to be sufficient? Do you ever need to charge more than one battery at the same time and would your boat benefit from having a multi-bank charger? Do you have batteries of different types and which will need supporting? Once you have some basic answers to these questions, it narrows the number of products down considerably making the shopping experience much easier. We’d also recommend opting for a well-known brand too even if it means paying a little more.